Parents play a big role in helping their children to be confident and enthusiastic learners by helping them believe they can do well at school, that trying hard and doing their best is important, and helping them be organised, navigate challenges and solve problems. Here are some tips and ideas about the things you can do to help your child’s learning. When a parent holds high aspirations for their child, they do better at school. Showing your child that you believe in them and their ability to do their best at school rubs off - it builds children’s confidence helps them see themselves as someone who can do well. Praise your child for trying hard (not just for doing well) and celebrate little successes. Aim high - let your child know you think that learning and school are important and that trying hard matters. Discuss aspirations for the future with your child - this is important at any age! Talk to your child often about the hopes, dreams and plans they have. Just spending time talking with your child helps them to learn and grow. Simple ways to do this include talking about what they’re learning at school and what they enjoy or find difficult. Talk with your child about what’s happening at school. Ask about activities, programs, what they are learning or what they found interesting or fun in their day. Even if the answers are ‘good’ or ‘nothing’, keep trying. Find out what your child’s favourite subjects are and what they are learning about. Try to make connections between what they are learning at school to everyday life - like practicing reading and counting at the shops. Talk with your child about social or cultural issues, or big ideas – discussion and exploration of big ideas encourages critical thinking, fosters curiosity about how things work, creates enthusiasm for learning and provides an opportunity to turn thoughts into language. Reminisce and chat about the times your family has spent together or talk about big ideas - such as the things you and your family believe in, your culture, science and nature or important issues that are happening in the community or the country. Parents have the biggest impact on their children when they help them to enjoy learning new things. Children learn by exploring new things and finding new interests. This can include everyday activities like cooking or shopping, cleaning, gardening, playing sport or going to community events, museums or libraries. Give your child the opportunity to be exposed to new things, to explore new areas of passion or interest, and to participate in family, community and cultural activities. Talk about what you are currently learning with your child and share the message that learning is important at all ages. Explain how you plan, solve problems and think about the future. Reinforce your child’s learning by going to libraries, museums, free concerts, sporting and cultural events together. The effect of reading to children takes root at a very early age. Reading together can broaden vocabulary, create an environment for learning together and provide a basis for later discussions. Having your child read to you is also a safe and nurturing way for children to practise reading as they learn themselves. Tell and talk about your own stories. Share stories from your own family with your child. Tell the stories that have been passed down for generations or that are part of your cultural heritage. Read and talk about books and stories with your child. Ask about their favourite character in a book or what they think might happen next in the story. Shared reading activities do not have to be in English to have an impact. If you speak a different language at home, you can speak and tell stories in your first language - this is very beneficial to your child’s education and life experience. Praise your child for their effort and persistence when they are reading. Ask your child’s teacher or school for advice or specific strategies to support your child’s enjoyment and skill development in reading. These days, reading involves more than just books - reading on hand held devices (e.g. iPads) is just as important, and helps to familiarise your child with technology as well as build their reading skills. There are two important things you can do to get the most out of homework. Build your child’s confidence and supporting them to be able to learn on their own. Create space - children benefit from organisation, and a prepared child is a successful one. Create a special space for doing things like homework and try to make homework a calm experience. Be available to help if your child has a question. If you are helping your child, try and make sure it’s a positive time that you share together, and focused on building their confidence. It’s good to have rules about homework, but it’s important to not create confusion by pushing children to do more, or expecting them to do less, than the school asks. You can talk to your child’s teacher if you have questions about homework. Praise your child for their effort and persistence when they are doing homework. Parents can help children develop friendships and get along with other people, including their teacher. Children tend to do better and enjoy learning and being at school when they get on with their teacher and classmates. Be positive about school and respectful of teachers. Support good relationships with friends and classmates. Talk about your child’s friends and relationships, about how they respond to any problems they are having and talk about their ideas for resolving conflict positively. 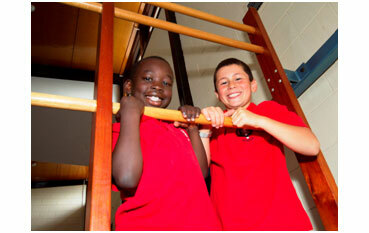 Skills that help friendships include cooperation, communication, empathy and emotional control. If your child has negative experiences, you can involve teachers and school staff to help with this. See more information about communicating with your child’s school on the communicating with your schools page.